Coarsely chop the chocolate sandwich cookies and set them aside in a bowl for now. Wash and dry the apples carefully. Remove the stems, and stick wooden skewers firmly in the stem ends. Place the unwrapped caramels and the water in a microwave-safe bowl. Microwave for 1 minute, then stir, then microwave for an additional minute or until completely melted. The caramel should be smooth and liquid by the end. Hold an apple by the skewer and dip it in the caramel, tilting the bowl at an angle and rotating the apple to cover it completely with a smooth, even layer. Bring it out of the caramel and twirl it upside down to remove the excess, then set it on the prepared baking sheet. Repeat with the remaining apples and caramel. Place the chocolate or chocolate candy coating in a microwave-safe bowl and microwave until melted, stirring every 30 seconds to prevent overheating. If the chocolate seems too thick, add a spoonful of oil to thin it out. Place the white chocolate in a separate small bowl and microwave it for 30-45 seconds. Stir the white chocolate, and if it is not completely melted, microwave it for another 10-15 seconds until melted, being careful not to overheat the chocolate. Place the white chocolate in a small plastic bag and snip off a small corner of the bag so that white chocolate can be drizzled from the corner. Dip a caramel-covered apple in the semi-sweet chocolate. 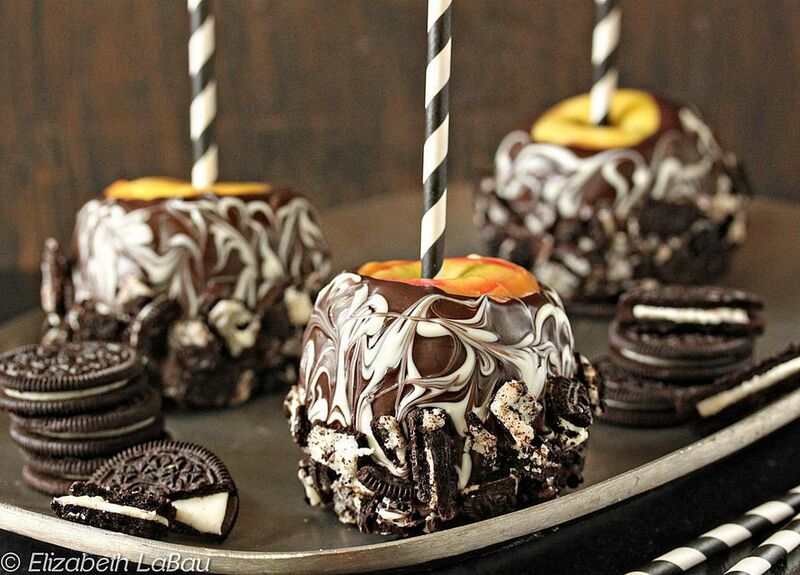 If necessary, spoon some chocolate over the top to ensure the apple is completely covered with chocolate. Hold the apple over the sink (or another easy-to-clean surface) and drizzle the white chocolate over the wet semi-sweet chocolate in a random pattern. Use a toothpick to gently swirl the colors together, being careful to not stick the toothpick in too deep and disturb the caramel layer. Press a handful of chopped cookies into the wet chocolate sides, coming about half-way up the sides of the apple. Replace the apple on the foil-covered baking sheet and repeat with the remaining caramel apples until all are covered with swirled chocolate and chopped cookies. Refrigerate the apples until the chocolate sets, about 30 minutes. If you will not be serving the apples immediately, tightly wrap them individually in plastic wrap and store them in the refrigerator for up to a week.